The Americana at Brand | December 2013. In our family it’s an annual tradition to get our dachshunds photographed with Santa, and this is Lily’s first Christmas and Emily’s second. It may seem silly, but I think the photos make for a sweet keepsake and are worth the effort. What do you think?! 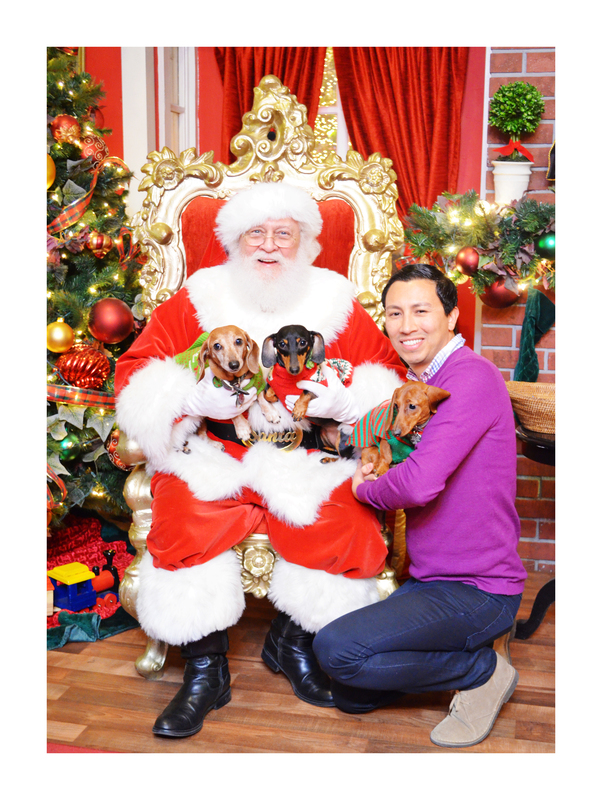 Do you get your doxies photographed with a local Santa?! If so please be certain to share yours with us on our Facebook page. Only 12 more short days until Christmas. If you still have some pending people on your list, consider a few of our unique DOGS gifts. 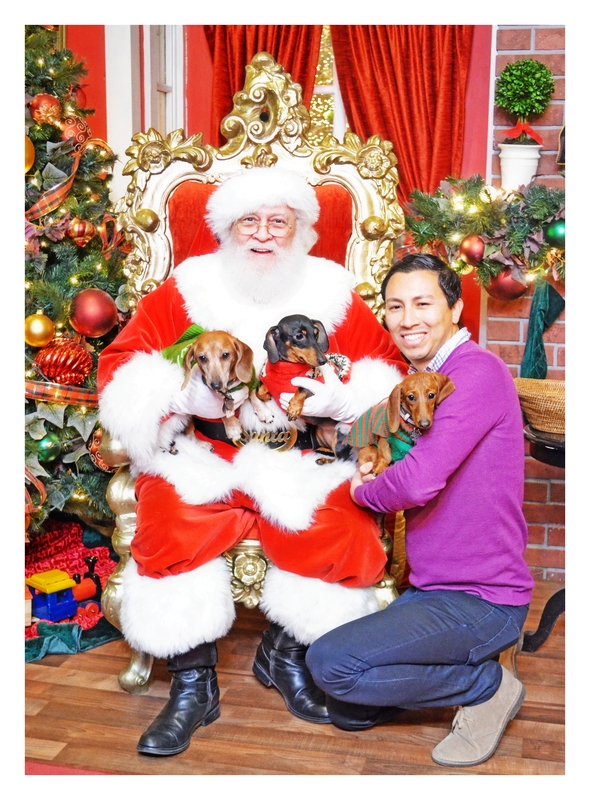 This entry was posted in Emily, Lily, Rufus and tagged #black and tan dachshund, #Christmas, #dachshund, #dachshund puppy, #red dachshund, #Santa, #smooth dachshund, doxies. Bookmark the permalink. Very nice Santa picture. I’m assuming Lily wouldn’t let Santa hold her. Photos with Santa are a MUST, especially the first Christmas (or hundred)….yours are terrific! Awwwww That is so cute. I have some almost wonderful news to share. I answered an add regarding a woman seeking a new home for her Doxie named Milo. She is currently living with her daughter and son-in-law and the son-in-law does not like Milo. So he runs away if the gate is opened and he had too much fun “decorating” the bathroom using the contents of the small trash can. Totally Doxie stuff if you ask me. She is bringing Milo to me this sunday so we can see how my Gretchen gets along with him. When we talked over the phone I could hear the pain in her voice. Milo is neutered, up to date on his shots and is used to cats and other dogs. Gretchen spent some time with a Doxie that was male and they became the best of pals. Doxies love other Doxies. I am sooooo happy! They do come in pairs right? Yes, I get my girls photo taken with Santa every year!! There are always rescue groups doing them, so it is a way to donate to help animals & every year we uphold the tradition with a yearly photo. Kind of like when we were kids & got the yearly school photo!! That’s what it is all about, Santa and the doxies! Santa Paws for the Doxies! Beautiful! You brought another happy feeling to my heart with your awesome photos. Thanks for sharing.